Key Takeaway: Simple living and frugality makes us more creative and innovative in making the most out of things – awareness towards things and money. Simple yet smart living is thus conducive to a purposeful life. Funny yet amazing how the simplest of everyday things can be so insightful – and, by extension, a way of life. This morning, as always, I was in a hurry to prepare (or direct to prepare) my packed lunch for work at the space. For efficiency, I always bring something mixed and in one dish only, such as a fried rice. Now, I want something different each day, to break any monotony and to explore new things. There was still some leftover cooked pasta, so I decided to use it. I’d already finished our Vegemite weeks ago in my usual Spaghetti with Marmite (or in this case, Vegemite), a recipe adapted by Nigella Lawson from her friend, Anna del Conte. So for a quick but hearty pasta sauce, I now turn to a quick, un-Americanized carbonara (no cream; instead, my far is extra-virgin olive oil) – or its adopted cousin, Nigella’s lemon linguine. But when I tried using calamansi (Philippine lime) last week, I couldn’t taste it at all. We also didn’t have grated cheese in the house right now – so low on resources and time, I improvised: I made it Japanese-style, combining an egg with extra-virgin olive oil, ponzu sauce, a little soy sauce, and pepper. I’m still going to try it this lunchtime, so I hope it’s good. Not to show off my culinary skills (or lack thereof), but the point behind it: When faced with scarcity, we are forced to stretch and innovate. And why not be like this all the time? That is the magic of simple, yet purposeful, living. When you’ve got less of anything, especially if you’re used to having more, you find yourself trying to be creative with the little you’ve got to maximize your use out of it. This forces us to not be complacent, to not waste a moment’s time (or resources) – to make the most out of it. For example, if you’re an entrepreneur and you’re not earning very much, you look for other ways to earn income (or in the business itself) without taking up so much of your time. Or if you don’t have all the ingredients you need or want at home to make a certain dish, you use other ingredients that you’d otherwise never think of using. When you live a life of purpose, this is actually a very desirable way of thinking – and so, by extension, is simple living. By being frugal about things, by not being so materialistic or extravagant, you learn to practice awareness towards what little you have, so that your perspective on things such as consumption or even efficiency is shaped for the better. You learn to be more contented with less, and to maximize the use of that less that would otherwise not be so maximized. That’s why simple – but smart – living is purposeful. They say necessity is the mother of invention – and so it is. By finding yourself in the need to be creative and innovative, you get to do so. Hardship is also a motivation to be more persevering in life. Not that we should impose poverty on ourselves – but rather, we can learn to want less, to give more, to live more simply yet effectively, to learn to make the most of what we have and stretch the limits of our thinking. To think out of the box. You can’t get any more purposeful when you make the most of things. Rooted in awareness and service, of course. Update: The pasta WAS good, though I’d salt it a little bit more. 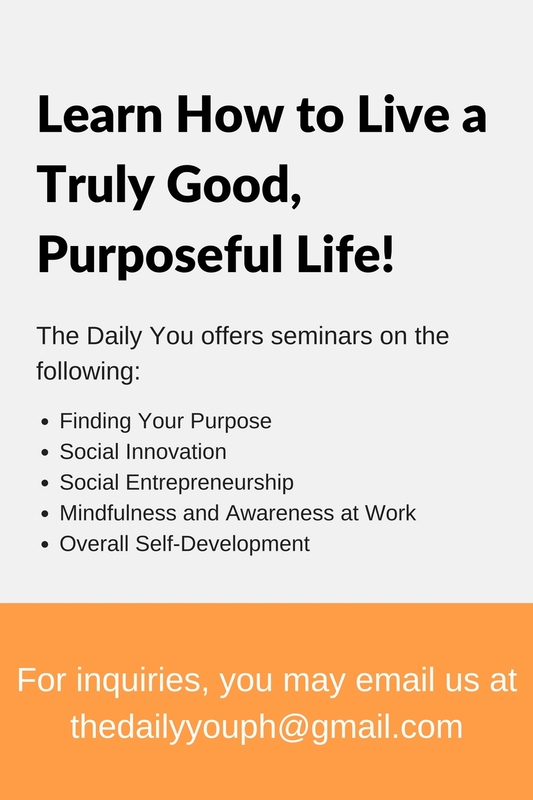 Tags: higher purpose, Purpose, TDY, The Daily You, Today. Bookmark the permalink.